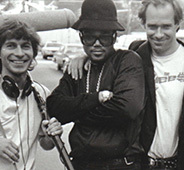 In 1986, Dutch music journalist Bram Van Splunteren and a small film crew travelled from Holland to the boroughs of New York to document a developing music genre called hip-hop. The end result was Big Fun in the Big Town, a powerful documentary that brought hip-hop into the lives of many people in the Netherlands for the first time. Without knowing it, Bram created a time capsule that documented hip-hop in a transitional period when it was beginning to show signs of being the unstoppable force it would eventually become. Featuring a newly minted DMC with his brand new Cadillac, an ambitious Russell Simmons and a young LL Cool J (still living in his grandmother’s house) along with many other icons, the footage was shown on Dutch television and then shelved for the last 26 years. It could have been forever lost if it wasn’t for Dutch hip-hop fans who taped the original broadcast of the documentary and shared it between each other through dubbing VHS tapes. Now in 2012, production company Five Day Weekend has finally officially released the film for the first time. Two days after the release we sat down with Bram to get some insight on how the film eventually saw the light of day once again. So you had the movie release two days ago, how was everything? Great. Well I’m just getting the reviews from the American media – from the people who do the promotion over there – and there has been so many good reviews that it is really overwhelming. Five Day Weekend hired someone to do the promotion in the US and UK. I’ve already done many interviews with several American websites and online magazines who have reviewed it and there is a long list of very good reviews which I’ve been really happy with. After the broadcast of the documentary it never saw the light of day again, but Dutch hip-hop fans recorded and shared the film through VHS dubbing, is that right? I know that happened in Holland for sure. In Holland the film was already a phenomenon within the hip-hop scene. Some people have told me they have watched it over a hundred times. When it was on TV for the first time they taped it and just watched it over and over again and just learnt all the lyrics from all the raps. Some people even told me the film changed their life. It was the first time they had seen the music they were interested in, where it was coming from and all the history behind it. People have told me stories of starting bands, playing covers of Schoolly D andstuff like that. However, as far as I know, the film never really left Holland until two years ago when somebody posted it on YouTube. How did the talks start regarding releasing the DVD? Did they contact you and did you always think about releasing it eventually? We never thought about it because we thought we were a relatively small company in Holland and Holland is already a small country. I just made the films and then I moved on; I don’t really look back on what I’ve done. The organisation I worked for don’t really have big promotion or distribution channels that could get that off the ground. I just thought that it was fine that I made a film, and it received a good reaction in Holland. Then two years ago somebody from America wrote to me expressing their interest in the film and asking if they could have a viewing copy, but I didn’t hear from them for a long time after that. Every now and then they would write me a note saying they were still working on it. Then about nine months ago, they had me interviewed by some journalist that was going to write the liner notes, so we went through the whole film, the story behind the film, how it was produced and all the stories behind it. It’s unreal that I am doing interviews and getting all this coverage now. Each day I get new reviews. This is a film I made 26 years ago and the film is only 40 minutes long, so how can this be? I probably won’t make money off it, but I don’t care. It’s just rewarding to get such a good reaction. To be honest, I felt the film was always underrated in the Dutch media but not among the fans. The people in the hip-hop world, they all knew this film, but no one ever wrote a decent review about the film except for maybe a short little piece once in a music magazine right before it was played on TV. Suddenly, yesterday in one of the big Dutch newspapers, some guy knew the film because he was a hip-hop fan himself and he wrote this incredible piece saying how influential the film was for the Dutch hip-hop scene and what a great film it was. Well, the film is truly amazing. What was your favourite moment of making the documentary? I have a few… We talk to the music teacher Dennis Bow, who explains how music programs were being cut in schools in New York and so the kids had no possibility to learn music despite their interest in it. So they developed their own kind of music where they didn’t need instruments or lessons. Then after that there are a couple of guys who are standing in a group and one of them is rapping. He is talking about how he is making love to a girl like he was going to the station and pumping gas. It ends with “I make love better than Michael Jackson and his white glove”. Then you see the guys sort of silently waving their hands or just snapping their fingers and dancing. It’s just such a nice scene. It wasn’t rehearsed at all. It just tells you that for these New York kids, this is almost like breathing for them. Some of them became stars and others, like this guy, were never heard of again. It just proves that the level of performing rap in those days was already so high in New York. I had been preparing for it a lot before because I already had a radio show and we were just playing a lot of rap music on the show that was originally an alternative rock program on national radio. Then we discovered rap at some point in 1984 and in 1985 we started playing rap. We started playing more rap and hip-hop and people became really upset because they hated rap music, they just wanted to hear guitar music. We got all of these letters with people saying stuff like “This is not music, what is this?” and “Stop playing that! Have you guys gone crazy?”. We really had a lot of opposition when we started doing this, but my colleague and I felt that this was important. It is not strange that people react in such a negative way, because the same thing happened with punk before that, beat music in the ‘60s and rock and roll in the ‘50s. Then I did interviews, for the radio show, with the Beastie Boys and LL Cool J on the phone. I knew this guy in New York from Def JamRecords, which was the most important label at that point in rap music. The publicist Bill Adler was just great to work with and at some point I asked if he could help us out seeing as we had the money to make the film. He was a great help and got us lots of contacts. The one thing that was kinda scary was going to all the African American neighbourhoods. I remember the very first time we rode in a taxi to Harlem. It was probably 125th street and we were there with our film equipment and then the taxi driver asked us what we were doing there as no Caucasian people were apparently allowed up there. That sort of scared us, as we all knew the stories about the Bronx being a bad neighbourhood. You started filming these acts at a stage when they were at this transitional period where they were going from being virtually unknowns to big, big stars. How were they to work with for the most part? I was a rock journalist for 10 years working for magazines and radio, so I knew interviewing people was not a problem for me. We had a nice little segment with Run and Jam Master Jay in the studio, but LL Cool J in the end was the big present we got for being so persistent. We just went to where he was and then his grandmother opened the door. We shot this really nice scene that captures the moment when LL was still living with his grandmother. DMC was just so nice and LL was a very smart kid, as he knew that he was doing really well with his record at that point. He was doing lots of interviews, but when we did interview him he was very professional. I always remember when I’m conducting a music interview that you are probably going to ask questions that they have been asked before. I like the moments when they sort of fall out of their roll a bit and they do something. There’s a moment in the film when we walk with LL down his street in Queens and then suddenly you see the little boy in him when he tells us, “Watch your back because you might get hit!”. I thought it was such a funny moment when he said that, he is just that kid in the neighbourhood, not yet a star. Also what really helped was that I stressed to Bill Adler that we wanted to interview his stars not in the office or in their hotel rooms, but on the streets of New York. I think that helped a great deal. People are just looser, more relaxed and not so self-conscious. Of course it is already visually more interesting to see the streets of New York, but also people are more relaxed when they’re just out on the streets. What is your opinion on hip-hop right now? Do you still listen to it? Well, I must admit I listen to a lot of music now on CDs from when I was in my twenties and thirties. I don’t keep up; I don’t buy that much new music. I listen to some of it on YouTube or on the radio, but I don’t know a lot about new hip-hop. I sort of hear the big names on the radio every now and then: Snoop Dogg, 50 Cent – but I don’t keep up with all of the new stuff. We might make a 26-years-later version of Big Fun as I’ve been approached by a production company who is interested in doing that. It’s crazy. It would be fun to see, to go back and also look at the new kids today and see what they’re doing and how they are going about trying to become a star. It would be culturally interesting to see what has changed and what direction the music has developed. The idea was to have LL Cool J as the main focus because we were in touch with his management and hopefully with all the good reviews the film has been receiving we can get his attention. We would love it if he could come to New York with us and show us around some of the spots we had been before, look at the kids on the streets now and how New York has changed. In this way, he could be our tour guide of New York and around that we could visit all of the other people like the ones you mentioned just now.